Yes, we love that it’s almost time for the third annual "Love. 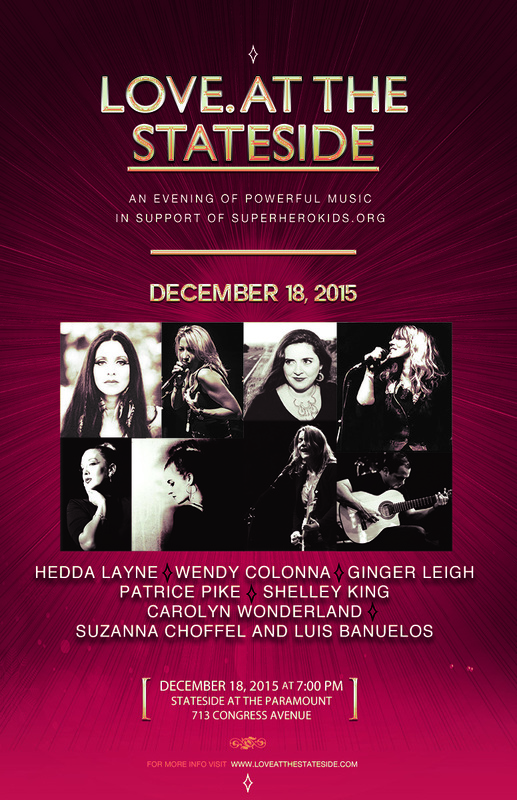 at Stateside" this Friday, December 18, 2015 at the Stateside at the Paramount Theater in Austin. The inimitable champagne chanteuse (as we call her) Hedda Layne appears with Ginger Leigh, Patrice Pike, Shelley King, Wendy Colonna and more special guests, Suzanna Choffel and Carolyn Wonderland. This one-night-only will be an incredibly powerful event. In the lobby (and for a special main stage appearance) is the unmatchable Luis Banuelos on flamenco/Latin guitar. So, go listen to holiday songs and original music to help these talented dynamos raise funds for the Superhero Kids organization which supports children and families at the Dell Children's Blood and Cancer Center.